What better way to present your favourite wedding photos than in a beautifully designed and crafted album. There is something really very special about handling wedding albums and seeing photos of you and your loved ones in print. Its fantastic having your images digitally giving you the option to do your own prints and even create your own photobooks. The reality is though that unfortunately a number of the consumer printing places just aren’t quite up to the task of providing you with absolutely stunning print quality and album manufacture. For your wedding photos it really is worth spending just that little bit more and owning something that you’ll be proud to show off to friends, family and colleagues. And remember, this is something that you’ll be wanting to show off to future generations too! It took me quite some time to find the right album for my photography but with Folio Albums I definitely now have the perfect finished product. Images are printed onto fine art, archival quality paper using inks that will last a lifetime and beyond. The design process for your album is really quite simple. Once you’ve had chance to go through your wedding photos all you have to do is let me know which photos are your favourites (I usually ask for around 20 as starting point) and then I’ll design page layouts to tell the story of your special day. Once you’re happy with the page layouts all you have left to do is choose the colour and material of the album cover. You don’t have to make the decision to have an album at the time of booking. 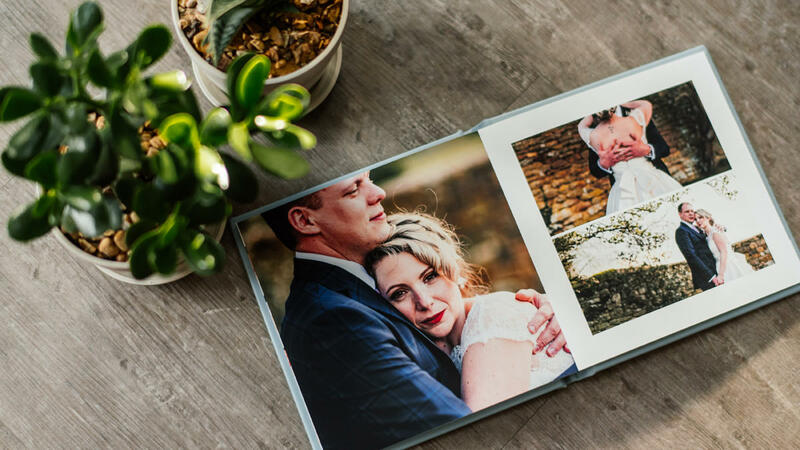 I’ve had a number of couples order their wedding albums the year after their wedding as a gift to each other for their first wedding anniversary. Which is very fitting as traditionally the first anniversary gift would be paper! Wedding albums are usually a family’s first special heirloom.